I think I finished my review of the tenth Maisie Dobbs novel by making the desperate (and untrue) pronouncement that if Maisie and James didn't get together in the eleventh, I would quit reading the books. Winspear knows how to quell an adult temper tantrum-- Maisie and James do, in fact, marry and conceive a child in the first chapter of A Dangerous Place. But I won't spoil more than five pages for you to let you know that Winspear doesn't give them a happy ending raising a baby on a farm in Canada, safely away from the bombs that will drop on London during World War II. No, Winspear's Maisie isn't made out for domesticity, it seems, and her aging uterus isn't destined for motherhood, since Winspear bumps off James (yes!) and the baby (I know!) in one fell swoop. Months later, after recuperating in India (natch), Maisie finds herself mentally unfit to make the final leg of her journey back to England and stops in Gibraltar, a British garrison town on the Southern tip of war-torn Spain, where she works to solve the murder of a Jewish photographer and finds herself drawn into the political intrigue of the place. 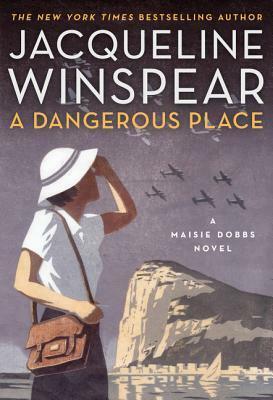 As far as Maisie Dobbs mysteries go, this one was fine. Winspear knows how to work a setting, and her description of Gibraltar had me searching plane tickets on Expedia. Winspear does a nice job explaining the situation in Spain without it feeling like a textbook, and she does a similarly nice job with her the Sephardic Jewish characters. But I was reeling after the first chapter and needed time to mourn myself. I feel like Maisie suffers from the Murphy Brown problem-- could Maisie have a baby and still be Maisie? Can she solve crimes if she's pumping breast milk? I can't imagine Winspear wanting Maisie to be the kind of mother who leaves her baby with a nurse or nanny all day, and James was never the kind of man who would have wanted his wife to be in that position. So Winspear dodges that bullet by cutting Maisie off at the knees and taking both husband and baby. Can Maisie ever just be happy? I'm not sure. Winspear has effectively said that she will never be a mother, and based on what's coming up in European history in the coming years of the novel, I would say that peace and happiness aren't on the horizon any time soon. Has anyone else read A Dangerous Place? I'm dying to talk with someone about it. Not the mystery, so much as the bomb of James's death. Oh man. So many thoughts. First, NOOOOO! Seriously?!? Why?!?! I agree - Winspear seems to think Maisie can't be true to her character if she gets married and has kids, but I feel like Winspear is just being lazy. I feel like this storyline is just like the first time we got to know Maisie. Here she is mourning the death of a lover. Where have I heard that before? Oh yes, Simon and Maisie storyline. Come on Winspear. You can do better. I think Maisie would be more interesting if she navigates solving crimes while having a family. It would give a different dimension to the story. But Maisie in mourning - been there. And of course, it's completely unsatisfying because she kills James off in the first part of the book. We don't even get to see them married. I feel like Winspear is just relying on the fact that we all love Maisie to keep buying these books. But I am frustrated. what did you think?? I was crushed and the ANGRY when I read the opening chapter of this book. Are we never to be allowed to see Maisy happy and at peace with her life. Based on the story line from previous books that took James and then Maisy to Canada surely Maisy's decision to marry James and her adjustment to marriage and domesticity could have been played out for one book! Winspear surely had enough to work with if only for a few months of wedded bliss. While I recognize that life often has many tragedies, I believe Maisy could be much more interesting going forward if she had been allowed to evolve as a wife and/or mother.